Due to the rapid expansion of its national horticultural retail business and the desire to serve its core customer base the very best that it can, Park Seed Company has decided to no longer operate its retail garden center at the corporate headquarters in Greenwood, SC. Additionally, it has made the decision not to host the Flower Day event that it has previously hosted during the Greenwood, SC Festival of Flowers in June. Park Seed Company has identified that its mail-order retail business represents the vast majority of its customer base, which is continuing to grow. Therefore, this spring, the company is realigning its resources towards serving its customers to the high standards that they demand and deserve. Although those in the Park Seed family will truly miss playing in the dirt and directly interacting with customers, these difficult decisions were necessary and will ultimately allow their customers to be served better. 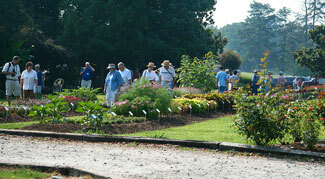 Park Seed will continue, however, to be involved in community gardens. In fact, the company has donated over $30,000 worth of seeds in the past four months and looks forward to working with additional organizations. Please feel free to contact them at (864) 223-8555 in regards to requests for donations. And as it has done since 1968, Park Seed continues to fully support the mission and events of the SC Festival of Flowers, which bring thousands of visitors to Greenwood, who get to share the joy of gardening and horticulture. The Topiary Display, which will be ready for viewing during the month of June in Uptown Greenwood, is a must-see. Please take a look at their website, scfestivalofflowers.org, for all details and family-fun activities. And you'll even have a chance to pick up some of Park Seed's products for free, as the company is donating a variety of seeds that will be given away during the Festival of Flowers' Flower Power Presentations. So be sure to come out and join everyone! Park Seed Company is very thankful for the continued customer support and hopes to provide your favorite seeds, plants, and gardening supplies for years to come. Also, feel free to visit the Park Seed family on Facebook, where your questions will be answered and helpful information shared with fellow gardeners. Thank you again, and happy gardening!